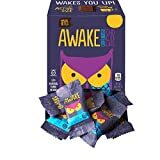 Awake Chocolate is a brand of chocolate where caffeine is infused with the milk chocolate in order to create a much higher caffeinated snack than milk chocolate would deliver on its own. 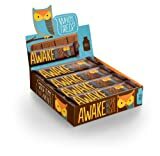 Awake advertises that a bar of their chocolate contains "about as much caffeine as a cup of coffee". We did a little investigating and nailed down a more exact amount for the caffeine content of Awake Chocolate. 1.55 ounces of milk chocolate typically contains about 9mg of caffeine. 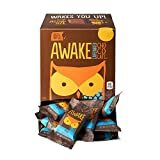 The makers of Awake Chocolate add in another 101mg of caffeine to give it a grand total of 110mg/ bar. Awake Chocolate also comes in a few other sizes and varieties. Here's how they stack up caffeine wise. Caution: A whole bag of the Awake Milk Chocolate Bites would contain 530mg of caffeine, so follow the 1 bite per serving suggestion on the bag. This brand was originally launched in Canada, but has begun selling to US customers. Awake chocolate is available at retailers such as Winn Dixie, Hess, Barnes & Noble Campus, and HEB as well as online through Amazon. Non-Medicinal ingredients: Milk chocolate (sugar, cocoa butter, chocolate liquor, cocoa powder, skim milk, soy lecithin, artificial vanilla flavor), succinylated mono- and diglycerides. Data Sources: http://www.awakechocolate.com/ and correspondence with the company.